gas liquids. The pipeline explosion occurred at the Paradis Pipeline Station. Paradis is located in St. Charles Parish, about 30 miles west of New Orleans. 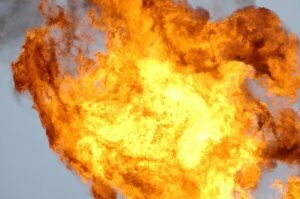 According to nola.com, three Phillips 66 employees and three contract workers were cleaning the pipeline when the pipeline explosion occurred. Two of the contract workers suffered burn injuries and were transported to a local hospital, one of which was later flown to a burn unit in Baton Rouge. Three other workers were treated at the scene. As of 2:00 AM, one Phillips 66 worker remained missing. Sixty homes within the vicinity of the pipeline explosion were evacuated shortly after the fire, and will remain clear while officials let the fire burn off, which could take anywhere from a few hours to a few days. The Edward A. Dufresne Community Center in Luling is being used as a shelter for evacuees while the evacuation order remains in place. Officials are currently investigating the cause of the explosion and subsequent fire. Several people reported a loud “boom” at approximately 7:00 PM on Thursday evening; however, minimal details regarding the reasons for the explosion are currently available. Our Pipeline Explosion Lawyers at The Lambert Firm have more than 40 years of experience representing explosion and burn victims and their families. If you have questions or concerns about the Phillips 66 pipeline explosion, contact us today at 1-800-521-1750.